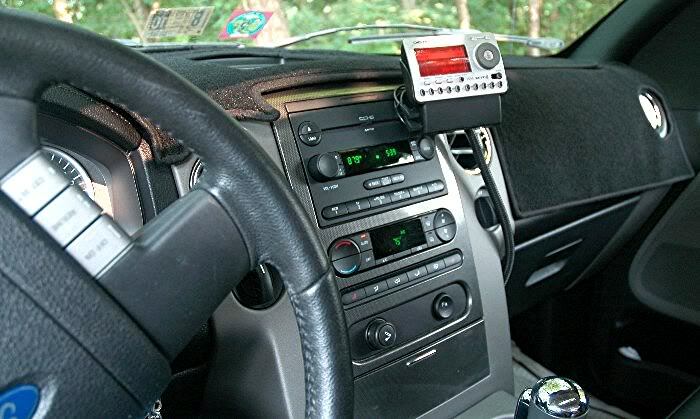 I have a 2007 Ford F-150 FX4 Scab purchased last Summer, been using a SkyFi cradle with wireless mod and power extension so it laid over on right end of dash near radio ant as a temp solution. I mounted the cradle on a block sitting in the tray and velcroed the XM antenna up at base of windshield. 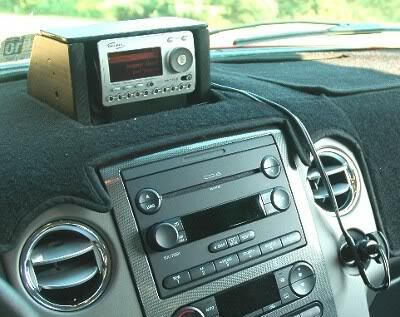 Hey .... it works but I get interfearence in cities with strong FM stations, Ford reciever is good. 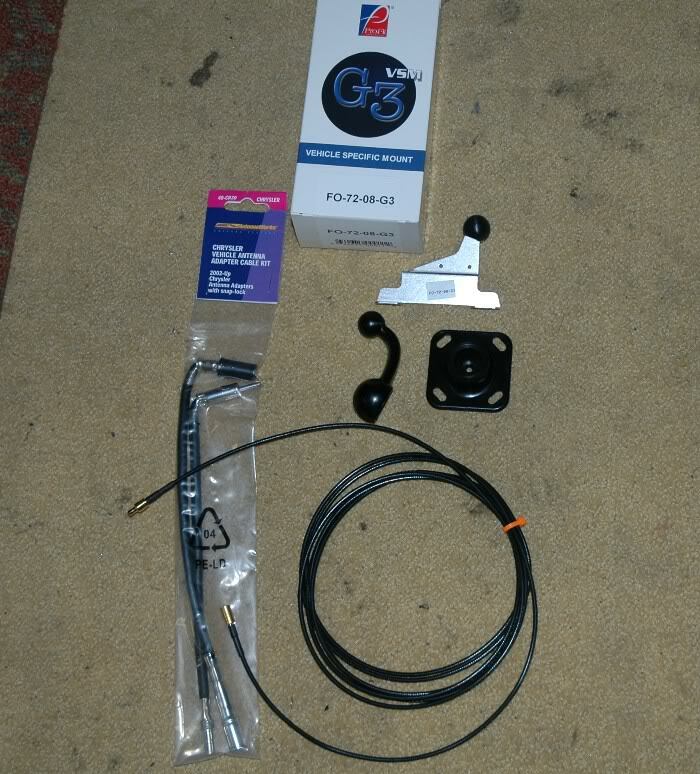 I ordered a ProFit VSM G3 mount system, a 10 foot extension for XM / Sirius antennas, and a pair of adaptors to adapt the '07 Ford's antenna plugs to Motorola plugs so I can use a wired in Delphi modulator. 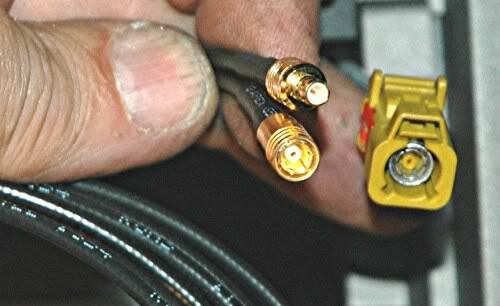 As soon as it all get's here, I'll redo my install using the Sirius antenna that's already on the truck, simply unplug it and connect to the extension and that should more than reach my cradle. 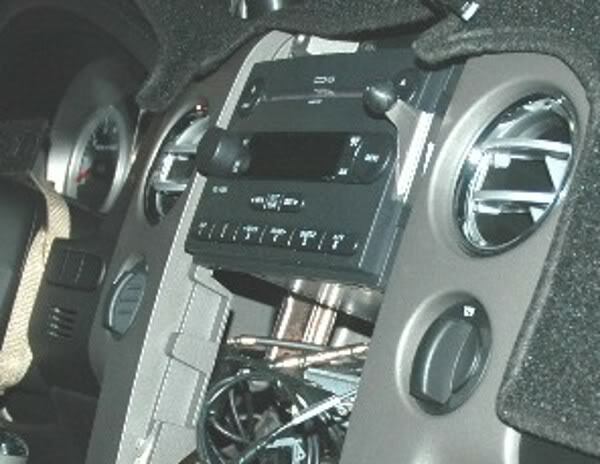 I'll mount my modulator behind the dash under the radio, and run the wires one of two routes .... either across to right end of dash under the carpet black DashCover molded cover, or in a split loom straight down from the cradle down past the console on the right and up under the dash. I'll tie the split loom to the mount to take stress off the wires themselves. The ProFit VSM G3 mount system came July 1st direct from ProFit who list this particular one for $49.95 but I only paid the vendor [sorry, no linking to that site] $39.95. I was skepticle of quality, but I must say .... while there isn't but three pieces, they are top notch quality! Base mount is stiff stainless steel with hard molded ball on it, and the J Arm and the A Plate base for mounting the cradle have sockets lined with molded silicone like rubber, very tight fit to hold adjustment .... tight enough that I am thinking of making a small plate and using the one mount to mount both GPS and XM cradle, but likely will just use it for XM. They make their own antenna ext cables and ship that direct from MRS and it hasn't arrived yet due to holiday weekend I guess. Between the two, I just did pass the "free shipping" standard of $50 order total. The Motorola to new Ford and back from new Ford to Motorola antenna adapters also arrived July 1st, got the pair for $18 with shipping from one vendor. Metra is the brand, they are the same as 2002 up Chrysler. Will take pics and post whole deal when I get that remaining 10' ext for the truck's Sirius antenna cable to my cradle. 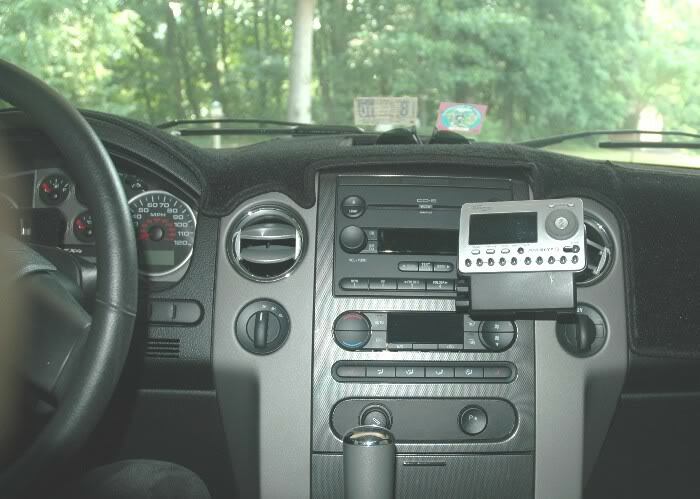 This was the old set up, housed in home made box painted black, used wireless modulator laying in far right corner of the dash with power to it. 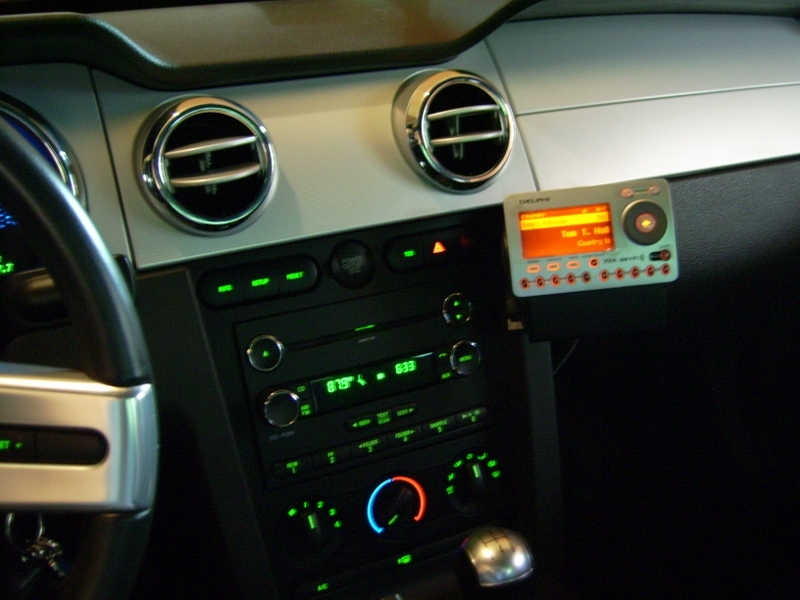 I forgot to hoto the removal of the radio surround bezel, but you'ld be hard pressed to beat this example I think. So I got it off and this is thje opening with the loose plugs. The locking tab or "press here" point was factory marked with white dab of paint. Two had what I call "lever locks" on them. That's the factory installed Sirius radio above the hole, se that cross brace with a couple holes in it. I made a mount of 1/8 aluminum, attached my wired in Delphi modulator to it with two rivets along with the black ground wire, and bolted it to one of those oblong holes like so. Here are the three items I was waiting for and detailed in the prior posting. After pulling the radio out a ways, I unplugged the factory am/fm antenna and installed the two adaptors you see labelled for 2002 up Chrysler, they work on many new Fords too including my 2007 F-150. I replaced radio, leading the two Motorola style plugs in view now. Next I unplug the Sirius antenna from the Sirius radio recvr and compare it to the new 10 foot XM ant ext cable. Looks good, but I removed the red clip and slid the yellow sheath off the Sirius cable and stuck it back on the Sirius radio for safe keeping. And then I install ball mount under right side radio screws. The socket of the A-Plate and j-arm are both lined with a molded silicone feeling type rubber and some spit helps when attaching in a "twisting" motion. thjey are tight fits. 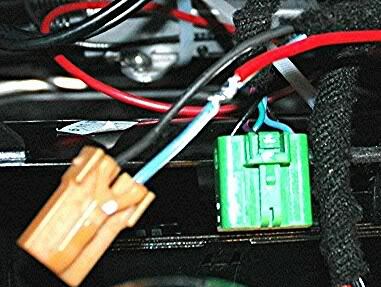 For power, I spliced into the Blue with White Tracer wire of the cigarette lighter which was right there so handy. I did use a light to make sure I had the right lead, but the other one was black so I figured I was on the right track. Of course, I wrapped the soldered joint with tape. 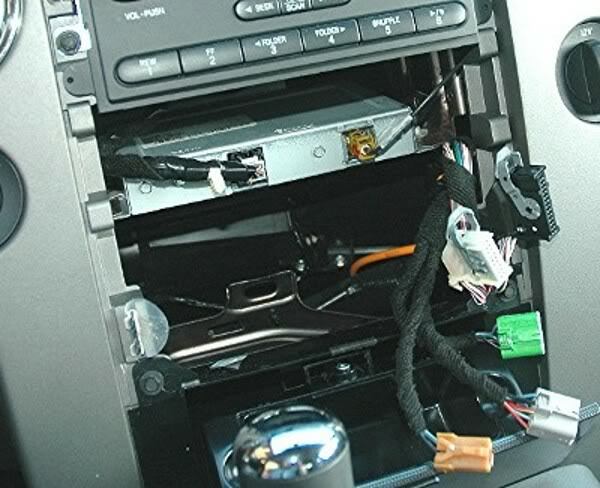 Now, I just ran wires out under the dash over into the pass floor area for now, and snapped the radio surround in place, and snapped my mount together. I attached the A plate to a cradle, and in the dark night, powered it up on the 50s on 5 with my am/fm set to the right frequency. Three bars with XM radio on a Sirius antenna with ten extra feet of cable. Better to make use of that lump on the roof this way and not have an extra XM antenna to contend with. No terrestial signal, but here in the country, there's no repeaters. And then the next day, after I got my coffe in and I played with it. Ran the wires up through split loom covering for now, wire tied the split loom to the mount itself. 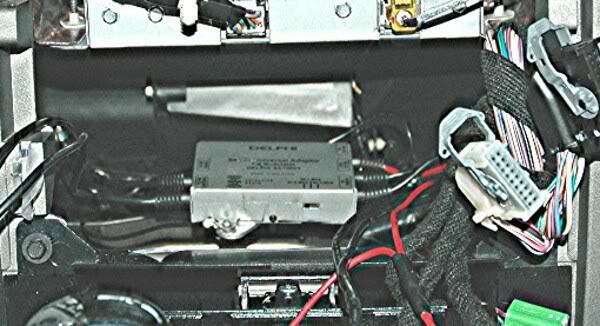 Only three wires, two from the Delphi Modulator and the one Antenna extension. Took her for a test drive, reception is extremely steady, no drop outs. Even works better than universal magnet mount antenna on the dash anyway under some trees where I've noted problems. On the mount, the Delphi SkyFi is heavy in it's cradle, heavier than new stuff. On just the mount ball and the A plate, it doesn't "shake" with the bumps. but it's more restruicted where you can put it. Maybe some piece of black soft foam behind it to dampen vibrations? Using the J arm, you can easily swing it out of the way of loading a CD for example, but bumps cause minor shaking. I have the J arm in place here raising the SkyFi up higher though it'll swing in a 360 degree arc if you wanted it more left or rightor lower. I don't see any viable alternative to the wires in the split loom unless I cut an access hole in the bezel surrounding the radio and stuff. 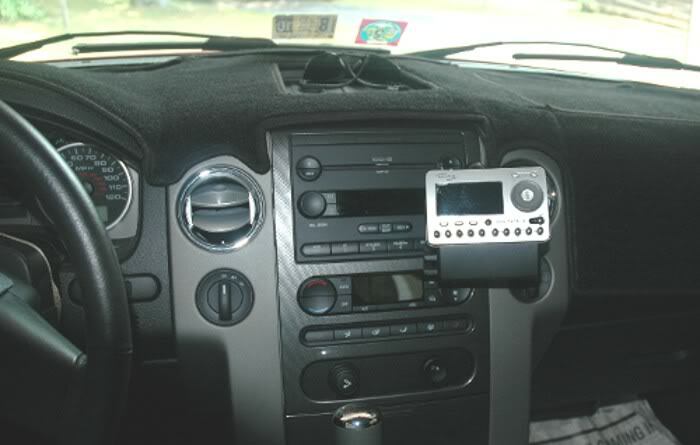 I may see how much a new one cost and once I have one in hand, I may do that and bring the wires out of the dash near the cradle through just such a hole. I might try laying the wires across from the front of the dash under my cover if I can find a way to get them up there? As for me, I'm OK as is if I can't ..... after 31 years of driving work cars with great pride which had radio and radar cables everywhere. You get used to them if they are kept tidy. Pardon my sloppyness, it's very late and I just can't sleep for some reason, yet I'm tired. Today after it cooled off outside, I pulled the cradle off the ball, ubdid the split loom, removed the radio surround bezel again and studied it. I then removed two screws at top above radio and popped the small package tray up and unhooked the line in plug by pulling out two tabs as I pulled down. The tray has a rubber molded insert. 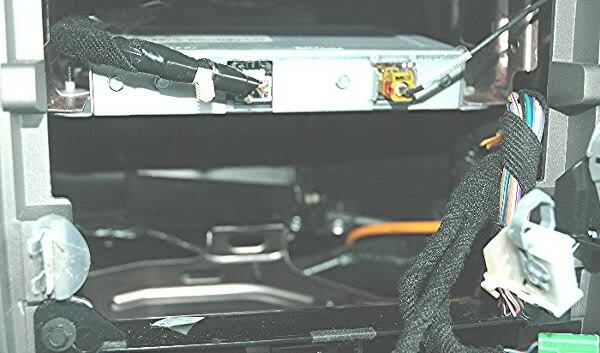 I rerouted the two wires from my modulator, line out and power ... and antenna cable .... up past radio and over the top under the area where this tray sat. I drilled two 1/2" holes, one in the near front right corner and one just behind it (towards front of truck like) in the tray itself. I cut the area out between thus leaving a 1" long 1/2" wide oval. I can replace the tray very easily as every Ford from 2004 up has one or it'll be cheap new. Besides, remove the wires and drop the rubber insert back in place and no one could see the hole. I pulled the three new wires and connectors through, replaced the line in jack, put tray back in place and inserted the screws. I replaced the radio surround bezel piece, and popped the J-arm with cradle back in place. I stuck the rubber insert back in the tray and it neatly pushes the three wires over to edge. The wires are independent and lay flat under the carpeted dash cover and come out behind the cradle. You have to look for them to see. No more split look in view,. otherwise it's pretty much as above ... except I did repostion the J-arm from the high position above about 180 degrees swing thus lowering the cradle and SkyFi about 3-plus inches lower. Wires have plenty of slack, push excess back through hole in tray under rubber mat insert. One day last month I got in the truck and the mount had fallen. Not off the *****, but it had fallen slack. The ProFit VSM-G3 mount kit has a ball moulded to a piece of stuiff stainless upon which you can pop the A Plate onto direct or reposition with a J Stem above of below or to the side. These pieces have sockets with what seems like silicone that grip the ***** very tight. Mine had gone slack. Sent ProFit a detailed message and a couple days later, I got a new J Stem and a new type of A Plate which instead of just snapping on, has a locking collar so that it locks with a twist of the nut. I understood that now my mount plate would lock to the J Stem, but I was worried about the J Stem loosing it's grip like the original, so I used a piece of black foam tie / taped with black elect tape to the back of the arm below the socket to take the slack between the stem and dash. Works great and eliminated what "jiggle" it had going down the road. The J Stem locks to the plate now so when you move it, any movement is at the base ball mount. Excellent service and I like this locking plate better. Otherwise .... no changes. ProFit says that if I ever change vehicles, just mail them the mount base and they'll mail me one in exchange to fit the new vehicle. Last edited by tbear853; 10-14-2014 at 07:41 PM. Here some 20 months since last posting and my new improved Pro Fit mount is working great still, so well that I just recently installed another into our "new to us" 2008 Mustang GT. Last edited by tbear853; 10-14-2014 at 07:48 PM. Wow ... the years go by fast. Been in & out of hospital, but today "Wife Unit" and I went to Costco about an hour north, in the '07 truck ..... XM sounds flawless still. How are you powering the Sirius cradle? Is is your Sirius a lifetime subscription? Will using the antenna on the truck mess that up? Probably wired it in someplace. Using a different radio OR antenna won't mess up a Sirius lifetime subscription. Antenna has absolutely nothing to do with a subscription. 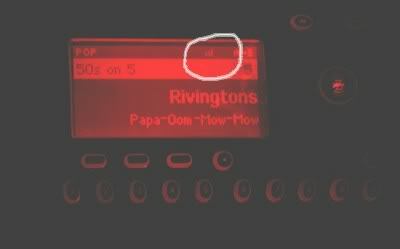 The only thing you need to do to keep your subscription when you replace the radio is deactivate the old one then activate the new one. Correct, my XM sat rcvr is on a life sub, I chose to use a wired in modulator, so my truck still has it's Sirius rcvr set which has no sub. I only need to unhook ant lead from my XM docking sta amd change the plastic part on end, plug back into radio and the Sirius will be all there but no subscription. I listen to my XM by putting rcvr in docking sta., turn on and set FM tuner to chosen modulator output freq. This post or thread was mainly about using Sirius antenna to get XM. Mine is XM side, when they started XM and Sirius were competitors, but satellite frequencies are near same, I just used the Ford Sirius intended antenna to receive XM signals. My XM is "LIFE" since 10-14 years ago at least, so LIFE sub stays with my SkyFi receiver. The Ford Sirius receiver and wiring are still in the truck, I just rerouted antenna lead which I can put back if ever desired. I can't hear anything on Sirius.